Sea otters near Calvert Island. Right: eating a red turban snail. Bottom left: a raft of otters. Top left: eating a red sea cucumber (with a red sea urchin on its lap). Photos by Keith Holmes/Hakai Institute (middle left), Kira Hoffman (bottom left), and Erin Rechsteiner/Hakai Institute. Scroll to bottom for more photos. At a maximum length of 1.5 m (large males), the sea otter is the world's smallest marine mammal. Its coat is reddish brown, lighter coloured on the head, throat, and chest, and bunched up in loose skin folds around the chest and neck. It has the densest fur of any animal, with at least 100 000 hairs per square cm. Its short flat tail is about a third the length of its body, and it has large flipper-like hind feet. The sea otter characteristically floats on its back to eat, and tends to stay in large groups that form 'rafts' with males rafting separately from females and pups. Sea otters spend a large majority of their lives in nearshore marine habitats, particularly kelp beds, reefs, and rocky islets. They prefer rocky sheltered areas that support kelp beds, and where the water depth is less than 30 m. The water must be unpolluted. 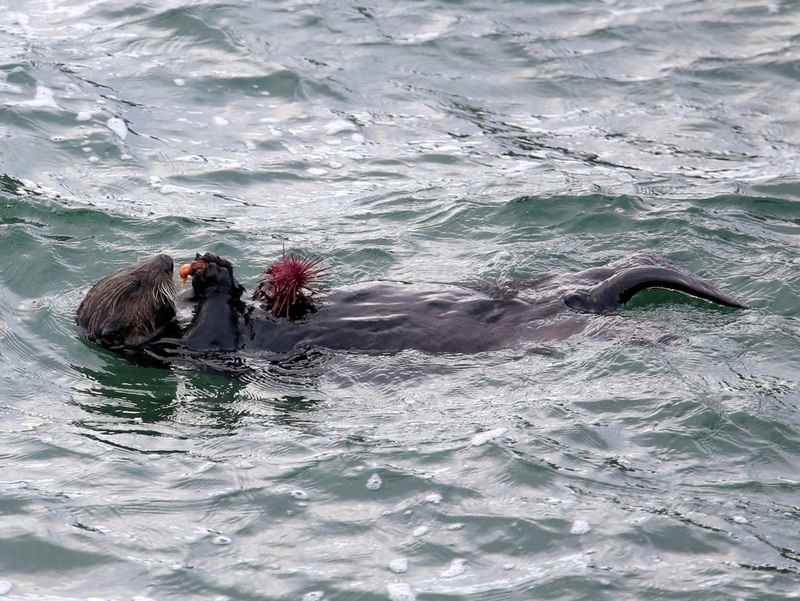 Sea otter distribution has greatly decreased from the species' historic range. They were once present in coastal waters all along the Pacific Rim from Japan to Baja California. When they were protected in 1911 there were less than 2000 individuals left and populations were restricted to coastal Russia, Alaska, and California. Now there are fragmented populations throughout the former range, including a relatively recently established population off the Central Coast. They now populate one-half to two-thirds of their historic range. There are three recognized subspecies: Enhydra lutris nereis, or the southern/Californian sea otter off California and Mexico; E. l. kenyoni, the northern/Alaskan sea otter in the Pacific Northwest and Alaska (including BC); and E. l. lutris, the Russian sea otter, in the western North Pacific. The river otter (Lontra canadensis pacifica) — found in coastal bays and inlets as well as freshwater habitats — is a similar size and colouring, and has the same flat, broad head. It has a longer, tapered, and somewhat rounded tail, and its neck is longer. It does not raft, nor does it float on its back to eat. Sea otters were harvested for their pelts in an intensive commercial fur trade from 1740 to around 1900, when numbers had decreased so drastically that the harvest was no longer viable. 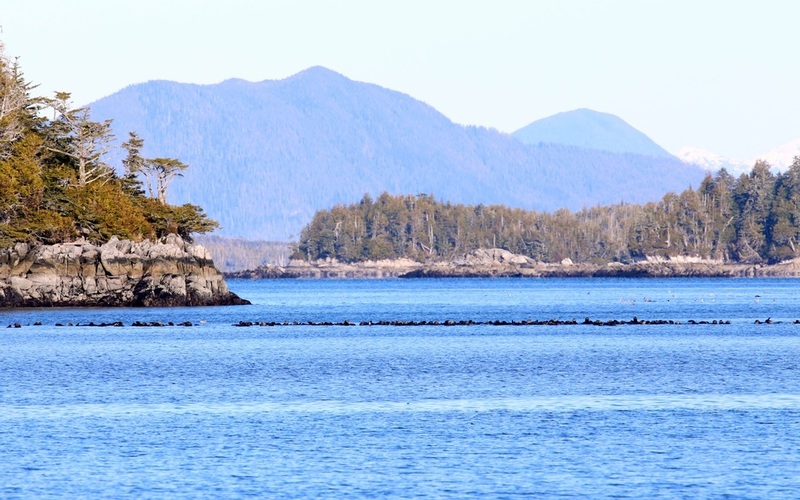 Prior to the commercial trade First Nations groups harvested sea otters for pelts as well. Sea otters prey on sea urchins, mussels, abalone, crustaceans, and other intertidal and subtidal invertebrates. They use rocks as tools for eating: while floating on their backs they use rocks balanced on their stomachs to break open shelled prey. They sometimes have favourite rocks which are stored in their armpits and kept for several dives. By feeding on sea urchins they play an important role in maintaining a delicate balance in kelp forests. When sea urchin populations numbers increase too high they can turn a diverse kelp forest habitat into a barren underwater landscape called an urchin barren. Sea urchins play the role of a keystone species by keeping urchin populations in check, and thereby maintaining the kelp forest and the biodiversity it supports. Instead of blubber sea otters are insulated by their extremely thick fur, which they keep meticulously groomed by rubbing and rolling the fur. They then blow air into the fur; the air gets trapped and, along with natural oils, provides water-proof insulation. Sea otters likely spend more time grooming than any other mammal in order to maintain insulation. Conservation: This species is blue-listed in BC. COSEWIC lists it as a species of special concern, and it is protected by the Species At Risk Act. It is listed as endangered by the IUCN Red List. The species has repopulated approximately one-half to two-thirds of its entire former range, but its current BC range is only one-quarter to one-third of what it once was. From 1969 to 1972 89 sea otters were moved to the west coast of Vancouver Island, where they have developed a healthy population of over 3000. In 1989 a small population was discovered on the Central Coast. While they have repopulated a significant amount of their historic range, numbers are still relatively low and the species is vulnerable to a number of threats. 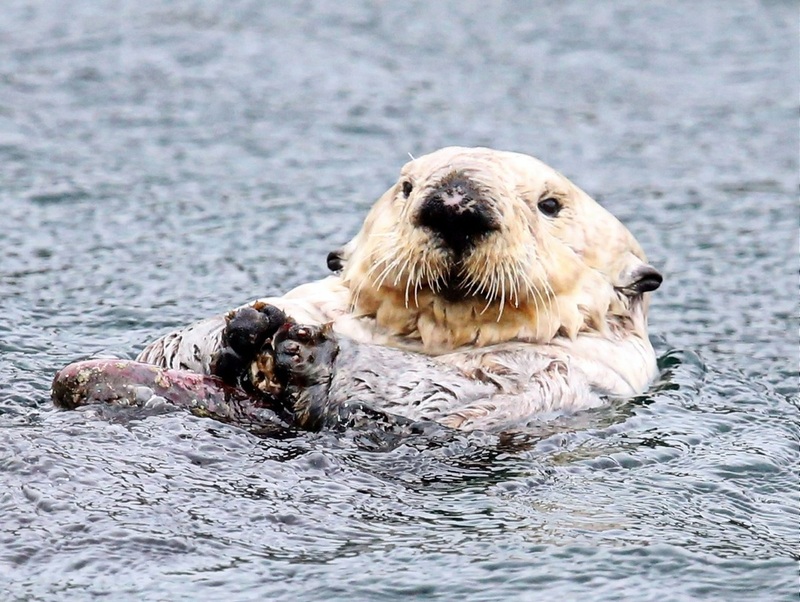 The biggest threat to sea otter recovery is the possibility of oil spills, as their habitat overlaps with oil tanker routes and they are particularly susceptible to the effects of oil. This was evident in the aftermath of the 1989 Exxon Valdez oil spill in Prince William Sound, Alaska, when an estimated 2,650-3,900 sea otters died. Oil destroys the water-repellant nature of a sea otter's fur, which eliminates its insulation and the sea otter subsequently dies of hypothermia. Oil is also ingested and the fumes inhaled when a contaminated sea otter obsessively grooms to remove the oil from its fur, and internal organs are damaged. They can also ingest oil through contaminated food. Furthermore, they are vulnerable because their rafting behaviour means that large numbers can be wiped out simultaneously, and because their kelp bed habitats tend to retain oil in the area. Scroll to page 26 of this COSEWIC report to read more about the impacts of oil. Other threats include predation by killer whales (which switched to sea otters when other prey populations collapsed) and eagles (which prey on pups), illegal hunting by humans, disease, other marine contaminants, collisions with boats, and entanglement in fishing gear. Read more about the threats to sea otters in the 2007 COSEWIC Assessment and Update Status Report, and the 2007 SARA Recovery Strategy. Read more about sea otters on the ARKive, Vancouver Aquarium, and National Geographic species pages. COSEWIC. (2007). COSEWIC assessment and update status report on the sea otter Enhydra lutris in Canada. Committee on the Status of Endangered Wildlife in Canada. Ottawa. Enhydra lutris (Linnaeus, 1758). In Klinkenberg, Brian. (Ed.). E-Fauna BC: Electronic Atlas of the Fauna of British Columbia. Lab for Advanced Spatial Analysis, Department of Geography, University of British Columbia, Vancouver. Accessed 08/09/2013. Harbo, R. M. (1999). Whelks to whales: Coastal marine life of the Pacific Northwest. Madeira Park, BC: Harbour Publishing. P. 192. Sea otter (Enhydra lutris). ARKive.org. Accessed 08/09/2013.